The management of diabetic retinopathy (DR) is increasingly dependent on retinal photography, often using one 45° field photograph (circle of Figure 1). 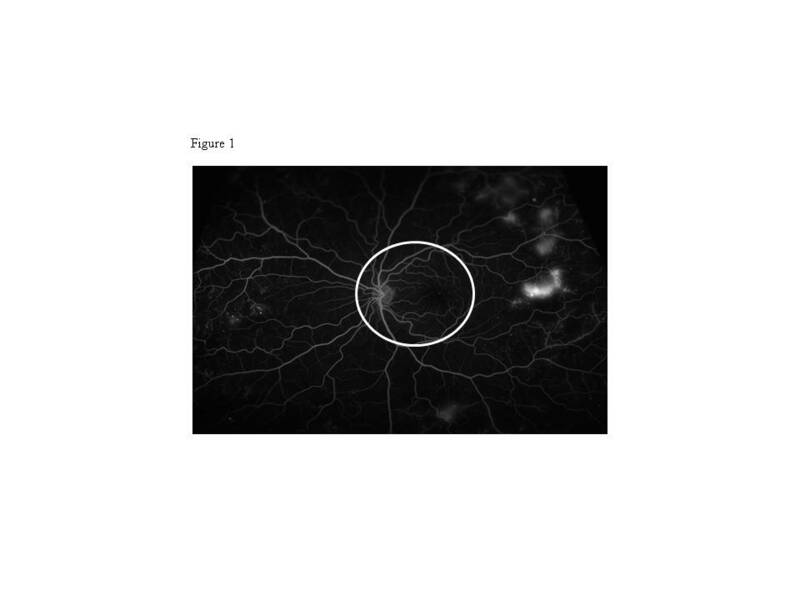 We found one patient had mild non-proliferative (NPDR) on a 45° photograph, but proliferative retinopathy (PDR) when examined using the Optos ultra-wide-field (UWF) camera which uses a scanning laser ophthalmoscope to obtain a 200° UWF photograph. This study examines whether the 45° photograph under-estimates the severity of DR. We studied 45 consecutive patients with 69 out of 90 eyes showing less than moderate NPDR in the Central Field (CF). The CF and UWF retinopathy grading of these 69 eyes were compared. We also determined whether fluorescein angiography (FA), using the same camera, enhanced detection of high risk retinal characteristics (ie non-perfusion, vascular leakage, neo-vascularisation) in 87/90 eyes. Three eyes were excluded because they also had high risk characteristics in the CF. Retinal photographs (unmasked) were graded by two trained observers and FA was graded by an ophthalmologist. Ten out of 69 eyes (*) were graded as having more severe DR on UWF, equivalent to a 2 step progression on the ETDRS scale, with two eyes demonstrating PDR (Table1). The combination of FA and UWF photography identified 22 out of 87 eyes with high risk characteristics not detectable by conventional FA, including three additional eyes with PDR (Figure 1). We conclude that UWF photography improved the detection of clinically significant DR in 14.9% of our cohort, with two eyes showing PDR requiring laser treatment. The combination of FA and UWF photography further enhanced detection of high risk retinal characteristics in 25.3% of individuals. Apart from helping select patients for more intensive monitoring and potentially earlier treatment to minimize loss of visual field, UWF retinal photography also has implications for epidemiological studies of the relationship between risk factors and prevalence of retinopathy.